I love the idea of a good breakfast pot pie. I've explored it as a homemade item (see below), but I've always wondered why you don't find them in the freezer section of the grocery store. So, I was pretty excited to see this product and my hopes were high. Banquet Pot Pies have always had a special place in my heart (perhaps I should say 'arteries'). 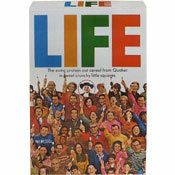 As a kid, we'd have them once a week. As I got older and realized they were about as healthy as a Cronut, they became relegated to a treat 3 or 4 times a year. They never taste as good as I remember them as a kid. But I always savor the experience for its nostalgic value. 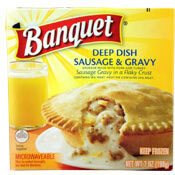 This product is described as "sausage gravy in a flaky crust" with "sausage made with pork and turkey." The package also states that it "contains 18% meat." The cooking instructions are simple. Just microwave it for 4 to 5 minutes and let it stand a few minutes. The first thing I noticed was that it smelled great when I pulled it out of the microwave. I was pleased with how the crust browned perfectly after 4 minutes and 40 seconds of cooking. I am happy to report that this product tastes great. The crust seems to be the same as that in a Banquet meat pie - maybe a little flakier. The sausage was flavorful with a hint of peppery heat. The gravy is thick and creamy. If you made a sausage gravy like this at home, you'd be satisfied with the results. It was a little bit too salty for my tastes. I wish they would have replaced 1/4 of the salt in the gravy with black pepper. Let's face it, biscuits and gravy aren't known for being healthy. So it's sort of unfair to judge this product on that criteria. The bottom line is this: When I take a bite, it reminds me of biscuits and gravy I've made myself or that I've had at a restaurant. Granted, fresh buttermilk biscuits with homemade sausage gravy will win every time, but for a commercial freezer product, this is the next best thing. With all that said, the nutritional profile of this product is not good. One serving has 450 calories, 28 grams total fat, 10 grams saturated fat, 35mg cholesterol, 850mg sodium and 39 grams total carbs. If you treat this product as a treat and are willing to put your diet on the back-burner, I highly recommend it. Try it at least once for the novelty of it. For a homemade breakfast hand pie, see my article Breakfast Hand Pie #1: Sausage, Egg & Cheese. 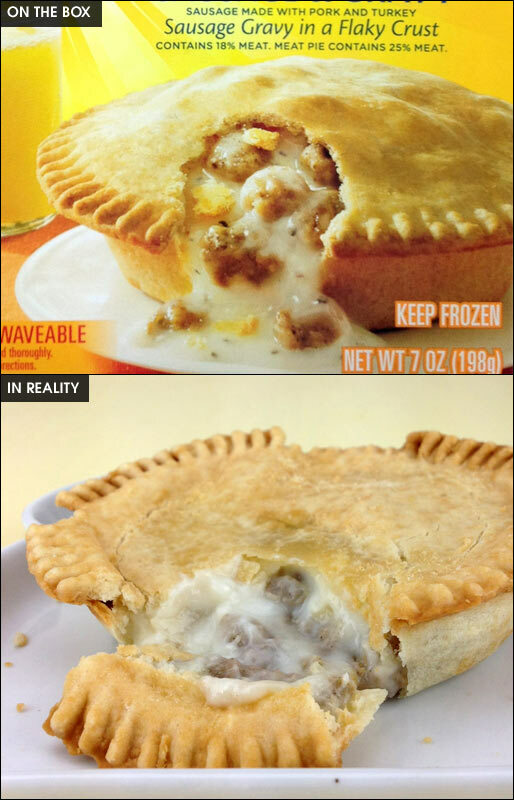 What do you think of Deep Dish Sausage & Gravy Pot Pie? Flaky crust, plenty of sausage and gravy inside. Smells great while cooking too! Once a week as a tasty breakfast won't harm you. Found them at Wal-Mart, add some cheese to see how it would turned out and really enjoyed it for breakfast. I love these pot pies. I am diabetic and they are perfect for when I wake up with very low blood sugar. But I eat them other times too because they're so tasty. Unfortunately they are extremely hard to find these days because grocery stores display them with the regular pot pies instead of the breakfast section. Who wants sausage and gravy for dinner? That's where they are. If they would put them with the other frozen breakfast items I'm sure they'd sell like crazy. I get them at the dollar store. Not at all concerned with fat with my metabolism, but they're spicy - so that is the one concern I have. It is a nice attempt and I love the idea but I won't buy it again because of the salt. It was just too salty, and I don't mind salt but too much is not enjoyable. I thought it was delicious. They are great for what they cost, under a buck. I eat one along with a hash brown patty that I bake at the same time a couple of times a week. Well, you're all welcome. I called the Banquet/ ConAgra question or comment line in the spring of 2013 and asked why they didn't make a breakfast pot pie like they do the regular dinner and fruit pies. I told them I can get those pot pies for $0.80, but all the other breakfast items available are $2.50 and up. So I usually just skip breakfast or have even eaten a chicken pot pie for breakfast. Yeah, I'm cheap. Guess they came though finally. Love the pot pies. Satisfying. For a buck? Heck yeah! Absolutely unhealthy, but what commercial breakfast food isn't? The sausage gravy, IMHO, is tastier than Bojangle's, and I'm a Southerner, so I LOVE Bo's. I have to give it a good review to make up for the previous negative comments. For 88 cents on sale, it is awesome! Mmmm... I love fat and salt! These are amazing, I just made one with 2 fried eggs with cheese and ate it like a skillet. YUM! These are the best pot pies banquet has ever made. I love pot pies and they are delicious. My wife does not love pot pies, and the other day she was fondly reminiscing about when we used to have a few of these in the freezer. They are weirdly delicious. I wish it had less fat. Why can't they? It's like death in a flaky crust. For that, I give it a 2 and, wow... the amount of salt... my sweet lord!